As a new recruit firefighter (“booter”) in 1977, I saw there was no record being kept by the department, or anyone else, of the department’s history. Any chance I got, I would gather the information for the intention of recording it someday. For four years (starting in 1980), a graduate class at a major university was assigned their final project of the year to evaluate all of the big city fire department in the United States to see which was the “best”. They had the criteria of fastest overall response times on calls, firefighters per thousand population, station coverage, specialized teams, number of annual calls for fire and Emergency Medical, and many other points. The Phoenix Fire Department won all four years so that project was shelved. But the Phoenix Fire Department was not always the best. 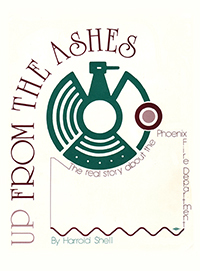 This book is the most accurate account of the history of the Phoenix Fire Department. Phoenix was named after the mythical bird that rose “Up From The Ashes” after being destroyed by fire. The reason for that name was not a fluke. It was because the town denied the need for a fire department, like many towns and cities in the 1800s. It took twenty years of researching through microfiche files of newspapers, city records, State of Arizona and Maricopa County records, departmental annual records, fire department log books, stories from the oldest veterans still alive and their relatives. My files took up an entire corner of our home dining room. I was told by my wife I had to find somewhere to store this stuff. I met with the Fire Chief at that time (Alan Brunacini), and he hear about what I was doing so he appointed me the department historian, and gave me a small closet to store the information. That was the start of this book. A book just about a city fire department can be really boring, unless you are in the fire service, or a relative to someone in it. I wanted to put a more human and humorous side to the book with real incidents that never made headlines or even the back page. I served over 25 years with Phoenix Fire Department, and enjoyed every moment. Some good and some not so good, but served with the best. The fire service is one of the oldest traditions in the world, but Phoenix broke much of that mold with inventive ideas and progressive programs, now are the standards in the fire service. This the story of Phoenix Fire Department, but also, the people who made it the great fire department acclaimed around the world. Enjoy!